Former Patriots tight end Aaron Hernandez committed suicide in April 2017. Oxygen’s two-part documentary about Aaron Hernandez, the former Patriots tight end who last year committed suicide in prison, has shed new, if not exactly definitive, light on rumors that Hernandez may have been gay. In Sunday’s second installment of “Aaron Hernandez Uncovered,” Hernandez’s attorneys said their client was “very concerned” that his sexuality might be discussed in court. On Sunday’s second part, Jenkins confirmed that another of Hernandez’s lawyers, Jose Baez, told her that the topic of Hernandez’s sexuality might be raised by prosecutors during the former football player’s trial on charges he killed two men in a 2012 drive-by shooting. 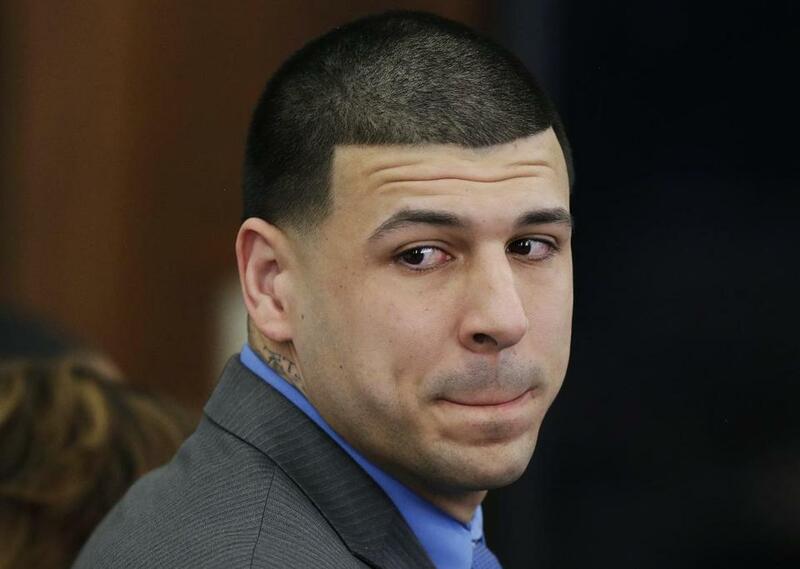 In the end, prosecutors backed off their threat to use the issue of Hernandez’s sexuality, and the former Pats star was acquitted of the two murders in April 2017. Leontire said in the docuseries that he’d spoken to Hernandez about his sexuality. Alyssa Anderson, who was the football player’s girlfriend when they were both students at the University of Florida, said in Sunday’s installment that she and Hernandez exchanged letters when he was in prison, and he opened up about his troubled past. She also said Hernandez had a relationship with a man in college, though she didn’t know if it was sexual. “Back in college there were text messages I saw on his phone when he came back from a trip to Connecticut,” she said. “There was a male, didn’t have a name, didn’t say too much, but it was a relationship with somebody. And when I questioned about it, he always denied it. “In one of the letters he opened up about it, and he did admit to it,” she said. Boston-based freelancer Michele McPhee was the first to report that Hernandez was bisexual and that law enforcement officials were probing whether an intimate relationship he allegedly had with a former male high school classmate factored into the motive of Odin Lloyd’s murder. McPhee’s April 2017 report in Newsweek stirred considerable controversy in media circles at the time.